BRING A TOUCH OF FRANCE TO YOUR HOME BY INCORPORATING FRENCH DESIGN ELEMENTS INTO YOUR EVERYDAY FURNITURE. DO YOU HAVE AN OLD PIECE OF FURNITURE LYING AROUND THAT’S IN DIRE NEED OF A RENOVATION? 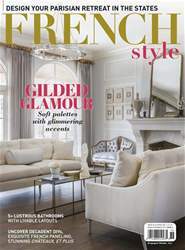 Before you throw it out, check out French Vintage Décor: Easy & Elegant DIY Projects for Any Home by Jamie Lundstrom. She uses her creative expertise to bring you practical and fun crafts that will revamp your furniture and give your décor a French vintage touch. Instead of keeping your drab table or vanity, you can add gold accents and French-inspired design elements to embellish your furnishings and bring your own personal touch. Lundstrom highlights over 60 different DIY projects that are easy to do and require minimal effort, leaving you with everlasting results. Her instructions will completely transform your bedroom, living room and even backyard. Just a few simple tips and tricks will help you easily replicate French style and bring a bit of Paris to your home.